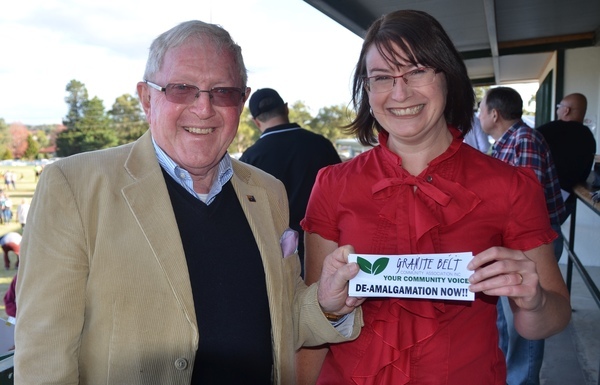 Granite Belt Community Association president Rev Alan Colyer and vice president Amanda Harrold. More than 300 community members attended to provide feedback at a workshop on de-amalgamation presented by Southern Downs Regional Council-appointed consultants in Stanthorpe last night, Monday 1 April. “We would like to thank the community for attending last night’s workshop at short notice and in such numbers and for providing extensive and wide ranging feedback.” said Granite Belt Community Association (GBCA) vice president Amanda Harrold. The council will hold a Warwick de-amalgamation workshop tonight, Tuesday 2 April, at the Warwick Town Hall at 7pm, following a budget information session commencing at 6pm. Amanda Harrold said the GBCA is calling on the SDRC to “start mending its relationship with the Granite Belt community by endorsing the Granite Belt Proposal to proceed to the next stage now, instead of waiting until the end of the month”. “This would be seen as a positive step in mending fences between the Council and our community,” Ms Harrold said. “Regardless of SDRC’s support the proposal will still be subject to analysis by the Queensland Treasury Corporation to establish its financial viability before Local Government Minister Stirling Hinchliffe will consider approving it. “In his closing statement the consultant, Mr Greg Hoffman, outlined that feedback received from the workshops would be compiled into a report that would be presented to council for their consideration. “When questioned if the report would be presented to the public and to the Minister, Mr Hoffman reiterated that the report would be presented to council only. “The Association again calls on the council to act with transparency and release this information to the community. •	A second de-amalgamation rally will be held on Sunday 28 April at C F White Oval, Harris Street, 11am for an 11.30am start.